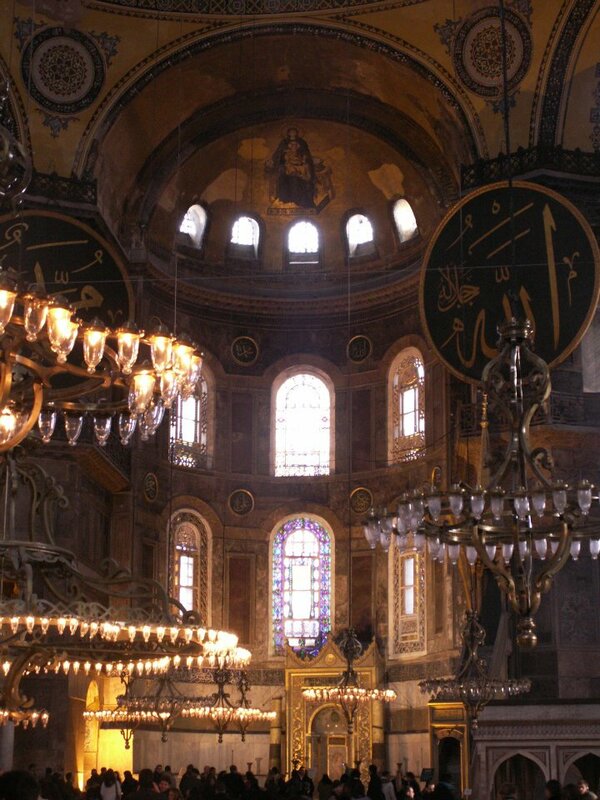 “Hagia Sophia (from the Greek: Ἁγία Σοφία, "Holy Wisdom"; Latin: Sancta Sophia or Sancta Sapientia; Turkish: Ayasofya) is a former Orthodox patriarchal basilica, later a mosque, and now a museum in Istanbul, Turkey. 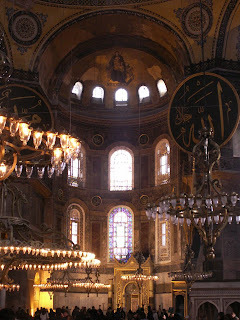 From the date of its dedication in 360 until 1453, it served as the Greek Patriarchal cathedral of Constantinople, except between 1204 and 1261, when it was converted to a Roman Catholic cathedral under the Latin Patriarch of Constantinople of the Western Crusader established Latin Empire. The building was a mosque from 29 May 1453 until 1931, when it was secularized. It was opened as a museum on 1 February 1935. Clarificare/remarcă importantă: din 360 până în 1054 (Marea Schismă), Sofia a fost, pur şi simplu, Catedrala Creştinătăţii. Şi acum…da, muzeu. Este greu să faci o asociere mentală între interiorul acela şi cuvântul muzeu. 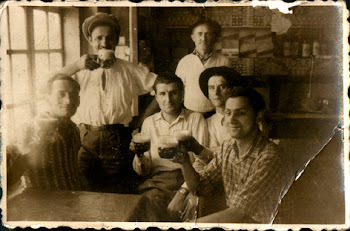 Poate că imaginea mea despre un „muzeu” era, până acum, cea a unui spaţiu aseptic, neutru, în care importante erau exponatele şi felul în care erau puse în valoare, şi nu „pereţii”. În Sophia m-am simţit strivită, dar strivită în mod plăcut, dacă mi se permite formularea, de Istorie, nici mai mult nici mai puţin decât de o mare bucată din istoria umanităţii. Nu m-a apucat zelul religios, nu m-am simţit nici mai ortodoxă nici mai atee ca de obicei. Dar am simţit „uimire şi cutremur” uitându-mă la fecioara Maria (care stă acolo, privind vrute şi nevrute cu un calm...divin, din 867) şi la îngerii ieşiţi parcă dintr-un text apocrif, doar aripi şi război. Din punctul meu de vedere Hagia Sofia (Sfânta Înţelepciune, să nu uităm) a devenit unul dintre cele mai convingătoare şi valoroase muzee de istorie din lume. Când vezi sfinţi palizi lângă împăraţi bizantini lângă citate într-o minunată caligrafie arabă te apucă un fior al vechimii, indiferent de ce ai nimerit acolo şi cu ce aşteptări. Bineînţeles, în acest caz este vorba de mai mult decât un muzeu, oricât de minunat ar fi acesta. Dar una din calităţile sale trebuie să reprezinte o caracteristică esenţială a oricărui muzeu care merită acest nume: un muzeu trebuie să te mişte, intr-un fel sau altul. Din muzeu trebuie să ieşi cu mintea mai deschisă şi spiritul mai înălţat decât înainte să păşeşti acolo. Important remark/clarification: from 360 to 1054 (year of the Great Schism), the Sophia was, simple as that, the Cathedral of Christendom. And now…yes, museum. It’s difficult to mentally associate this building with the word “museum”. Maybe that’s because my mental image of a museum has been that of a rather “aseptic” space, somewhat neutral, where the important part was always played by the exhibits and their positioning, and not by “the walls”. In the Sophia I felt crushed, but in a very pleasant way if I may say so, by History, a large chunk of humanity’s history. Religious zeal did not grab me, nor did I feel more orthodox or more atheistic than usually. But I felt “fear and trembling” while looking at the Virgin Mary (standing on the wall, watching a little bit of everything with…divine calm, since 867) and the angels brought out of an apocryphal text, all wings and war. From my point of view the Hagia Sophia (Holy Wisdom, let’s not forget that) has become one of the most convincing and valuable history museums of the world. When you see pale saints next to Byzantine emperors next to quotes written in a wonderful Arabic calligraphy, you experience a thrill of the ancientness, no matter why you ended up there and what you had been expecting. Obviously, in this case we are referring to a space that is much more than just a museum, but one of its qualities must represent a characteristic essential to any space worth being named as such: a museum must touch you, even more so, a museum must shake you. You need to walk out with a mind that’s more open and a spirit that’s more enlightened than before. Future tense, VII: What's a museum? On the changing nature of our cultural institutions. However perplexing the problems of the present and the future, however sobering the obligations laid upon the museums of America through the destruction of war, the past gives confidence for the days to come. What’s a museum? Lately, it seems, the answer is whatever we want. Today’s museums can be tourist attractions, department stores, civic centers, town squares, catalysts of urban renewal, food courts, licensing brands, showcases for contemporary architecture, social clubs, LEED-certified environmentally conscious facilities, and franchise opportunities. A “well-run museum is eerily like an upscale suburban shopping mall,” says an article in The New York Times. A cafe with “art on the side,”?advertises London’s Victoria and Albert Museum. “We are in the entertainment business, and competing against other forms of entertainment out there,” says a one-time spokesman for the Guggenheim museum. “Inclusive places that welcome diverse audiences” and “reflect our society’s pluralism in every aspect of their operations and programs,” suggests the American Association of Museums. “We live in a more global, multicultural society that cares about diversity and inclusivity,”?so “service to the community” is now among the museum’s à la carte options, says Kaywin Feldman, the latest head of the Association of Art Museum Directors. As reported in The Wall Street Journal, museums are even about “bringing art to those with Alzheimer’s or post-traumatic stress disorder, and farming crops for donation to local food banks,” initiatives that have been promoted through grants from the National Endowment for the Arts. By the numbers, today’s museums are thriving enterprises. Billions of dollars have been spent in recent years on expansion projects. In the United States, there were 46 art museums in 1905, 60 in 1910, and 387 in 1938. Today there are 3,500 art museums, more than half of them founded after 1970, and 17,000 museums of all types in total, including science museums, children’s museums, and historical houses. Attendance at American art museums is booming, rising from 22 million a year in 1962 to over 100 million in 2000, with 850 million Americans visiting museums of all varieties each year. Yet if today’s museums are successful cultural caterers with wide-ranging menus, no matter where we find them, their fare manages to taste more and more the same. A handful of the same celebrity architects now designs new wings and even whole museum cities such as Saadiyat Island in Abu Dhabi. Facilities in Spain, Boston, the Middle East, and Los Angeles all look different in the same way. An international class of museum professionals job-hops among Beijing, Paris, New York, and Qatar spreading a common corporate culture, where top directors are expected to command million-dollar salaries, oversee thousands of employees, fund-raise, invest and spend endowments on massive expansions, horse-trade the assets on the walls to create blockbuster shows that can attract headline-making crowds, and spin these activities to the press. Is all this hyperactivity the glow of health or the flush of fever? Philippe de Montebello, the former director of The Metropolitan Museum of Art, suggests the latter. With yesterday’s art traded away for today’s trends, exhibition halls taken over by “social space,” and new buildings expanding around traditional facilities, museums are shedding their old skin and remaking themselves in our image. It is said that museums have gone from “being about something” to “being for somebody.” “The work of art, once sovereign, has ceded primacy of place in many an administration’s attention to the public,” de Montebello lamented in a lecture at Harvard, published in the book Whose Muse? Art Museums and the Public Trust. Museums have traditionally been focused on their permanent collections. By emphasizing the visitor, museums now risk forsaking the visited and their own cultural importance. Museums were once the arks of culture. Now the artifacts at greatest risk may be themselves. Prosperity is a great teacher,” wrote William Hazlitt, but “adversity is a greater.” The story of London’s National Gallery in wartime offers up a poignant lesson about the historical relationship between museums and their permanent collections, and the lengths that nations will go to save them. During the Second World War, Kenneth Clark, the National Gallery’s young director, needed to get his institution’s collection of European paintings out from under the Luftwaffe’s bomb sites. As recounted in Suzanne Bosman’s 2008 book The National Gallery in Wartime, Clark was right about the threat to the collection in central London. Between October 1940 and April 1941, Nazi nighttime aerial bombardment struck The National Gallery nine times. On October 12, 1940, a German explosive leveled what had been the Raphael room. At first Clark removed the Gallery’s holdings from Trafalgar Square to a discrete handful of universities, libraries, and castles scattered across Wales and Gloucestershire. When Germany inaugurated its Liverpool Blitz and Nazi bombers came within striking distance of these temporary homes, Clark prepared an even more drastic contingency. He was aware of the U-Boat menace. Nevertheless, he drew up plans to ship the permanent collection off the British Isles to the safety of Canada. When Clark approached Winston Churchill about the move, the Prime Minister had a better idea. “Hide them in caves and cellars,” Churchill declared by telegram, “but not one picture shall leave this island.” Churchill’s remarks signaled the importance of The National Gallery and, in particular, its permanent collection to the identity of the nation. A work of art may exist in isolation, but a culture of art lives through museums and the collections these museums have maintained for the public. These permanent collections embody a museum’s identity even more than its buildings, its record of traveling shows, or any other aspect of its operations. Clark wanted to save the works of art. Churchill saw that Britain needed to preserve its culture of art as well. Sending away the art might spare the canvases, but it would mean disrupting the permanence of the permanent collection. In 1941, Clark found a way to honor Churchill’s determination. First he reunited the scattered collection by retrofitting an abandoned slate mine into an air-conditioned storage facility. A year later, he began bringing the collection back to The National Gallery through the “Picture of the Month” initiative. In January of that year, a letter published in the Times of London signed by a “picture-lover” wondered if there could be a way to bring the treasures of the permanent collection back on public view. “Because London’s face is scarred and bruised these days,” the writer suggested, “we need more than ever to see beautiful things.” Clark devised a way to bring up one masterpiece from the slate mine and exhibit it temporarily on Trafalgar Square. By night, and during daytime air raids, Clark moved the painting to a strong room in the basement. The first masterpiece to see the wartime walls was Margaretha de Geer, a work attributed to Rembrandt purchased by the Gallery in 1941 but, until then, never placed on public view. Even with severe limitations on travel, Clark calculated that as many visitors came to see that one painting each day as would have visited the entire National Gallery on a day in peacetime. The identity of The National Gallery is not found on a balance sheet but through an intangible idea tied to a collection held and displayed in the public trust. Since this museum was created when the House of Commons purchased the picture collection of the banker John Julius Angerstein for the nation in 1824, The National Gallery, which opened on Trafalgar Square in 1838, has from the start represented a British ideal of parliamentary government. Unlike many of the other museums in Europe, with their permanent collections nationalized from other pre-existing institutions, the collection of The National Gallery was purchased on behalf of the British people by their lawful representatives. To have sent away The National Gallery’s collection in wartime would have meant sending away a manifestation of British self-rule. The masterpieces that came on view through Clark’s “Picture of the Month” initiative were not merely Rembrandts and Titians, but the Rembrandts and Titians of The National Gallery, of Parliament, and of the British people. The great museums of the West, founded mainly between the late eighteenth and late nineteenth centuries, have almost all functioned like The National Gallery to represent the characteristic ideals of their nations, almost always through an identity intimately connected to their permanent collections. The Louvre was founded in 1793 to represent the French Revolution through the nationalized treasures seized from the monarchy, the church, and later colonial conquest, all to be exhibited in a seized Bourbon palace. The Prado Museum, which Ferdinand VII opened to the public in 1819 as the Royal Museum of Paintings and Sculptures, represented the last sparkles of beauty from the fading Spanish Crown. The Hermitage Museum, founded by Catherine the Great in 1764 and opened to the public in 1852, represented Russian imperial power through its ability to import great art from the West. After 1917, when many masterpieces of its permanent collection were sent into storage like locked-up dissidents, the Hermitage became a manifestation of totalitarian state control. The close association of European museums and their permanent collections with national ideals was underscored by their ownership, which to this day almost always remains some form of government control. Britain’s National Gallery, for example, describes its governing structure as a “non-departmental public body, whose sponsor body is the Department for Culture, Media and Sport,” with a board of trustees appointed primarily by the Prime Minister. In the United States, the same cannot be said of comparable institutions. American museums began to propagate a generation later than their European counterparts as an answer to those institutions, yet with a key difference that is so apparent it is often overlooked. American museums vary widely in their missions, but they almost all share a similar story as institutions founded and supported by private individuals. Today, most of them remain not-for-profit institutions largely supported through private donations. Their private status might seem to preclude the association of American museums with a national identity, but the lack of government ownership in fact goes to the heart of their own ideal. It may seem that the philanthropy supporting American museums is ancillary to the treasures the institutions contain. But those treasures, however singular, are also tokens of the idealism behind the institutions that maintain them. As manifestations of private wealth transferred to the public trust, American museums were founded, in part, to represent virtue. The visual education offered to the public by these museums through their permanent collections is not just an education in art history but also a lesson in how individual hard work can become an expression of virtue by giving over objects of beauty to the public trust. No other country has seen such private wealth, accumulated through industry, willingly transferred to the public good. Even as institutions around the world now attempt to supplement their own government funding with private support on the American model, the philanthropic culture of the United States remains a singular phenomenon. The countless “American Friends of . . . ” groups that now exist for cultural institutions around the globe are testament to America’s continued abundance of philanthropic energies. The American museum consciously emerged out of this ideal of self-governance, a belief that a virtuous people with a passion for the public good might create institutions in the public interest that could one day rival or even exceed the museums of Europe, all without the compulsion of government. Among the many philanthropic pursuits of the American public, the American art museum has received particular attention because its treasures serve as tangible manifestations of virtue. New York’s Metropolitan Museum of Art became the first of three great encyclopedic museums to open its doors in the United States within a decade of each other. Founded in 1870 and opened in 1872, it was closely followed by The Museum of Fine Arts, Boston in 1876 (also founded in 1870) and the Philadelphia Museum of Art in 1877 (founded in 1876)—institutions that were quite different from the ones we know today but nonetheless born out of a similar philanthropic urge. As recounted in Winifred E. Howe’s two-volume History of the Metropolitan Museum of Art, published in 1913 and 1946, the Met’s founding generation emerged out of the destruction of the Civil War to speak in bold terms about the virtues of their creation. They directly connected their new museum with the ideals of a reunited nation. In 1866, John Jay gave a speech at a party of his fellow countrymen at the Pré Catalan in Paris celebrating the ninetieth anniversary of national independence. “It was time for the American people to lay the foundation of a National Institution and Gallery of Art,” he urged. A committee of men formed on the spot to pursue the idea back in New York. It will be said that it would be folly to depend upon our governments, either municipal or national, for judicious support or control in such an institution; for our governments, as a rule, are utterly incompetent for the task. . . . An amply endowed, thoroughly constructed art institution, free alike from bungling government officials and from the control of a single individual, whose mistaken and untrained zeal may lead to superficial attempts and certain failures; an institution which will command the confidence of judicious friends of art, and especially of those who have means to strengthen and increase its value to the city and to the nation, is surely worth consideration in a club like this. So that this consideration would not be confined to the Union League alone, the club sent invitations to members of the city’s other thriving private clubs and art academies to join the discussion. Three hundred people turned out for a meeting at the Union League, then on Twenty-sixth Street. Our city is the third great city of the civilized world. Our republic has already taken its place among the great powers of the earth; it is great in extent, great in population, great in the activity and enterprise of her people. It is the richest nation in the world, if paying off an enormous national debt with a rapidity unexampled in history be any proof of riches; the richest in the world, if contented submission to heavy taxation be a sign of wealth; the richest in the world, if quietly to allow itself to be annually plundered of immense sums by men who seek public stations for their individual profit be a token of public prosperity. My friends, if a tenth part of what is every year stolen from us in this way, in the city where we live, under pretense of the public service, and poured profusely into the coffers of political rogues, were expended on a Museum of Art, we might have, reposited in spacious and stately buildings, collections formed of works left by the world’s greatest artists, which would be the pride of our country. He loved all forms of beauty, and with his largeness of nature and of means he became the greatest art collector of his time, and in the history of art his name must always rank with those great princes of the Old World who in former centuries protected and encouraged genius. He was as unselfish with his treasures of art as he was with his fortune. He believed that the happiness of a whole people can be increased through the cultivation of taste, and he strongly desired to contribute to that end among his own countrymen. Osborne’s urging was prescient. The assuredness of American museums through the first decades of the twentieth century, rooted in the virtues of their founders and supporters, gave way to a creeping professionalism that, in the name of good business and “best practices,” sought to strip the institutions of their virtuous past. Hoving was the first museum custodian to conceive of his permanent collection as a ready source of capital. In 1970, he purchased a Velázquez portrait for $5.5 million but lacked the funds to cover it. He began looking for works to sell, and the bequest of the late Adelaide de Groot was his principal target. Against the heiress’s wishes that her collection remain in the institution, Hoving sold off masterpieces from her donation—most notably The Tropics by Henri Rousseau—through Marlborough Gallery. The sale was so controversial that the Met’s curator of European painting refused to sign the deaccession form. Hoving signed it for him. Even as the Metropolitan under de Montebello, Hoving’s successor, rejected this legacy of affronting virtue, Hoving’s ideas infected museum culture. Granted, by narrowing or “refining” a collection through deaccession, a museum can perform a valuable function. It can free up work from storage that may be second-rate or repetitive. A museum can raise money in a restricted endowment from the sale, to be used for the purchase of art that might better serve its mission. Peer-review organizations such as the Association of Art Museum Directors issue guidelines that, at least on paper, restrict these practices in line with traditional standards. The aamd forbids museums, for example, from using the sale of art in their permanent collections to pay for general operating expenses or to underwrite loans. Such rules are designed to prevent museums from treating their art collections as ATM machines and sources of fast money. But museums have been finding ways around AAMD, even as this association finds subtle ways to relax its own rules. Museums have claimed, for example, that the art in their permanent collections suddenly does not fit their mission statements, even if the work has been on display for generations. Museums use deaccession to “trade up” their permanent collections, liquidating the symbols of donor virtue while creating a slush fund for their own acquisitions. Museums have decided that certain works are of secondary importance because they are rarely shown, although this record of exhibition may merely reflect the taste of the curators. If a museum is defined by its permanent collection, then any exhibiting institution with a permanent collection is a type of museum, even if it calls itself something different. Yet museums now routinely declare themselves to be something else just to get around the rules of AAMD, disregarding the spirit of virtue these rules represent. One of the worst acts of deaccession occurred against the legacy of none other than William Cullen Bryant, the great advocate of the Metropolitan Museum. At the start of the twentieth century, Bryant’s daughter gave Kindred Spirits, Asher B. Durand’s 1849 Hudson River School masterpiece depicting Bryant and Thomas Cole standing at Kaaterskill Falls, to the permanent collection of the New York Public Library. In 2005, Paul LeClerc, the president of the Library, sold the painting for a $35-million payday. Even after exhibiting Kindred Spirits for decades, the Library claimed it was not a museum and therefore free to sell the painting for cash. The LeClerc sale was a direct affront to the founding generation of New York’s cultural institutions and a demonstration of how his professional class could subvert the ideals of virtue at will. In 2006 the Albright-Knox Art Gallery sold $71 million of its collection of older art in order to buy contemporary work, claiming the older art did not fit its mission statement. In 2008 the National Academy Museum in New York sold two valuable Hudson River School paintings to fill a budget gap, proclaiming its primary status as an art school. In 2009, the trustees of Brandeis University announced plans to shut down the school’s Rose Art Museum and sell off the entire collection to raise general revenue. All the while, countless other institutions have worked under the radar to liberate their permanent collections from the restrictions imposed (as they see it) by the outdated mores of their donors. While the profit motive drives the businesses that fund philanthropy, the perceived profiteering of American museums breaks a covenant they have made with the public and damages the culture of virtue that continues to sustain them. Sometimes this is done consciously, as museum professionals attack the past from within. At other times these professionals do damage with the best intentions. Any museum decision that appears to capitalize on the permanent collection—from gift shops to high ticket prices to fancy restaurants to facility rentals—risks diminishing the museum’s virtue in the eyes of the public. What most museum professionals fail to recognize is that the principle of virtue means that good business often becomes bad business once inside the gates of these institutions. Headline-making cases of deaccession are only the most extreme perversions of America’s museum ideal, because they strike at the very embodiments of virtue. Most of today’s museums therefore acknowledge that their collections maintain some special status, at least in the eyes of a reactionary public. They have learned that deacessioning can invite unwanted publicity. So rather than go after the collections themselves, museums will more often update the facilities that contain them in order to recast or cover over the virtuous meaning of the objects inside. Today the American Museum of Natural History, founded in 1869, is a rare holdout of traditional museum culture. Its awesome display of cultural confidence begins with James Earle Fraser’s equestrian statue of Theodore Roosevelt riding through a triumphal arch at its front entrance. This foregrounds a soaring lobby designed by John Russell Pope in 1936 after Roman baths—a notably civic model compared with the more religious classicism of Germany’s museums. The same sense of veneration is applied to the facilities within. Bold signs throughout the institution proclaim the donors of specimens, all without a postmodern preamble about the misuse of taxidermy. Artisans are still trained to preserve the animal models and diorama rooms of the biologist Carl Akeley, who died on assignment for the museum at the spot now depicted in the gorilla diorama. The Hall of Northwest Coast Indians has been left primarily as Franz Boas, the great anthropologist, designed it at the turn of the last century. A refurbishment of this hall that could restore its original windows, uncover its columns, and elevate the lighting would easily bring this room back to its inaugural splendor. Ten years ago, the original architecture of the fourth-floor dinosaur rooms was similarly uncovered in a brilliant restoration sponsored by David H. Koch. There was a time, however, when this museum was far less assured of its past. In the 1940s, the institution’s fanciful Romanesque Seventy-seventh-Street facade, designed by J. C. Cady in pink granite dotted with turrets and globes, was to be wiped out with the application of a monolithic slab that the critic Christopher Gray likened to “some gigantic crematorium.” This new look represented the new faceless sense of what museums suddenly were supposed to be—museums without histories. What saved this museum? In part the AMNH came to see its own history as an object worthy of protection and study. It also got lucky, undergoing budget cuts right before the wrecking ball arrived. Today the museum seems more dedicated than any other to polishing up its past and celebrating its own history along with the history of its permanent collection. Many other institutions have been far less fortunate. The Brooklyn Museum, designed by McKim, Mead & White, lost its grand outdoor Met-like staircase to the rhetoric of “public access” in the 1930s, when the entrance was brought down to street level, the stairs ripped out, and a lobby carved out of the original auditorium. This loss created an architectural imbalance that has only been aggravated through the recent addition of a $63-million glass atrium. In the 1950s, the museum’s beaux-arts lobby was similarly stripped of its ornamentation and a drop-ceiling installed. All of these moves were designed to conceal, reinterpret, or destroy the museum’s one-time architectural grandeur and patrimony. The building, which required the demolition of Gardner’s historic carriage house, now serves as the only entrance to the institution and connects with the original museum through a glass-enclosed umbilical cord, which penetrates the back of Gardner’s fanciful Venetian building. Compared to Gardner’s grand pastiche of a museum and the limitations imposed through her trust, the Piano addition is ostentatiously invisible, obsequiously deferential, and more than willing to cater to the creature comforts of the visitor/end-user. The vertiginous theater-in-the-square turns the spectator into a spectacle. The Kunsthalle for new art, the eateries, shops, and apartments are all sumptuously attractive. A “geothermal well system, daylight harvesting, water-efficient landscaping techniques, and the use of local and regional materials” may make the new building eligible for leed gold certification. But what has been lost in the shuffle? How will this facility affect Gardner’s original vision and the mysteries of her creation? And if the new building is meant merely as an engine to generate new donors, couldn’t the trustees just as easily apply $114 million directly to the preservation of the original facility (where the water stains of a rusted-out skylight continue to streak down the interior walls)? In countless cases, the concern is that museum professionals have come to regard their founding generations with suspicion rather than reverence. They question the legacy of these industrialists and “robber barons.” They suppress the American idiosyncrasies of their institutions to appeal to international ideals. They undercut the signs of private philanthropy in order to seek out greater state control. They advance a new populist rhetoric that trumpets appeal and “access” over beauty and virtue. They attack their own “imposing” facilities and “elite” permanent collections. They undermine the art and architecture their supporters had given to the public trust. All along they sell their own expanding ranks and bureaucratic sensibilities to a complicit donor base as a way to counter, conceal, update, and “reinterpret” the influence of their museums’ dubious histories. But what if museums were to see these histories as something worthy of preservation and reverence? Some institutions have already taken such a turn. The Frick Collection, The Metropolitan Museum of Art, and the American Museum of Natural History are three of the institutions that have quietly rejected the spiraling demands of the professionalized museum by cultivating their own founding principles. What if all American museums were to embrace the virtuous intent of their founders and supporters? The answer is that the American people, once again, could become the connoisseurs of virtue.